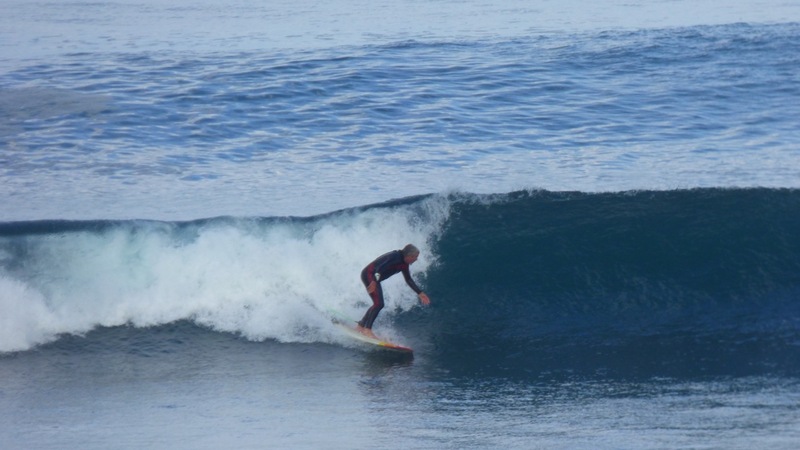 One of the primary reasons for travelling around Australia was for Dean to surf as many beaches as possible. The following is what he had to say about the waves he found. 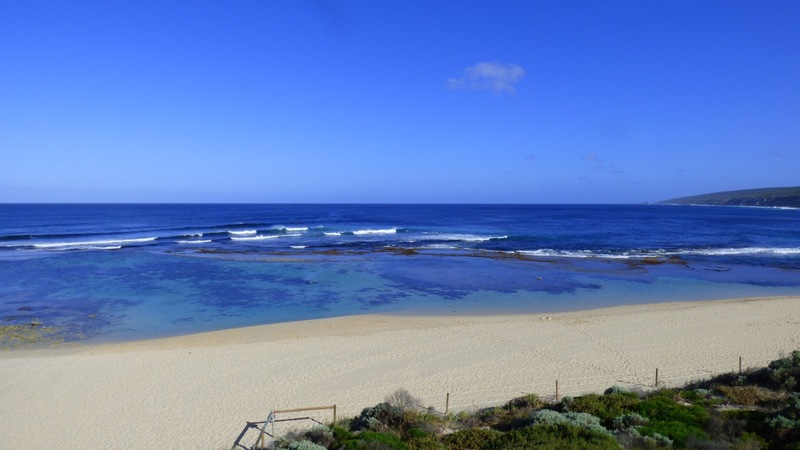 Just north of Margaret River you come to Yallingup – a nice quiet little sea-side town. We were there for just over a week and, although the surf had dropped back, there was a few waves to be ridden. Yallingup reef is a very nice left hand break and I did manage to get a few 3 to 4 foot waves that provided a good 150 metre ride. I was just a little disappointed that it didn’t really turn on while I was there. Another great spot for a surf all the same. What can I say about this great Aussie surf destination – WOW I can now say I have surfed this iconic wave. Spent five days here but when we first arrived it was only small – 2 to 3 foot and that was fun, but over night the swell rolled in and the sets were up to 8 feet. Now to me that’s pretty big. I did managed to catch a few and it did get the adrenalin flowing, but alas on my last day, I snapped my board when I had to bail off it to dive under a breaking wave. Rather my board than my back. And I wasn’t the only one, I saw a few get snapped while I was there, but it was definitely worth it. Make sure you get to this spot – just bring a back up. Lights Beach, just south of at Denmark in the Great Southern region of Western Australia is another nice stretch of beach with crystal clear water. I was really surprised that everyone was in wetties. I thought it was really nice to get out of it as the water was not too chilly at all and after a wait, I finally got on a wave. Although it was only around 3 foot, it was nice little 50 metre ride – well worth a look. Cactus Beach is found at Point Sinclair on the Eyre Peninsula just west of Ceduna. Head to Penong and turn left at the primary school, then after travelling along 21 kilometres of corrugated road you will come to the Point Sinclair Camping Ground and what a fantastic place. We stayed there for five days and had four days of surf on three of the four breaks all within a kilometre – Backdoor, Cactus, Castles and The Caves. When you surf here you are surfing in pristine location and it is a little eerie with the threat of an attack from a great white getting the adrenalin going. Backdoor is a ten minute walk around the cliff where the wave breaks 100 metres out on to a flat reef, and I spent an hour an a half surfing this right hand over head high break with another two surfers – it was scary. I surfed the three to four foot, left hand break at Cactus with five guys and had some really nice long rides. Then surfed at Castles which is another left hand along the reef into the channel. Finally, The Caves – it breaks a few hundred meters off a rock groin, with waves well over six foot on a right hander. So to any one who is down that way I urge you to take the drive down and you will have an absolute blast. I hope to get back there again one day. Situated in South Australia, between Victor Harbour and Cape Jervis – arrived at this beach and there was no one around, yet a nice little three foot left-hand break so I took the plunge and in I went. I surfed here here for about an hour on my own, really nice, then returned the next day when the conditions had picked up a little and there was about ten others guys out. Arrived at Torquay, Victoria and spent a week there doing all the beach breaks in the area. Torquay Point and Jan Juc were really small while I was there so I didn’t worry about getting in. But that didn’t stop others, there were heaps of guys just sitting out there bobbin around. Around at the iconic spots like Winky Pop, Bells, and around at Southside the waves were much better. I did have a surf at Bell and managed to get myself a few nice 4 foot plus waves. I didn’t get around to Southside were there is a nice left hander which would get pretty big in a decent swell. WOW! Magnificent! …but holy cow… the temps are cold! Still too cold for me. what wonderful places to surf – envy envy! Some of the beaches are very spectacular.